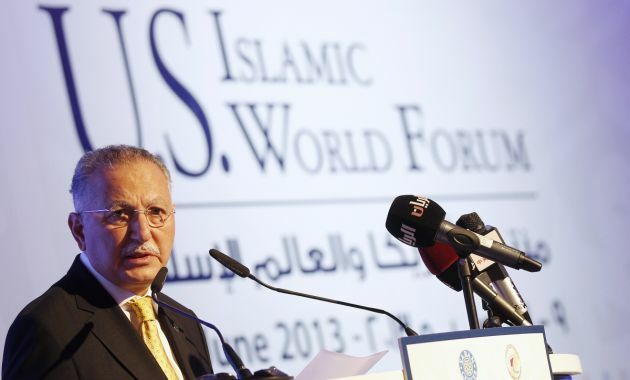 (Photo: REUTERS / Mohammed Dabbous)Organisation of Islamic Cooperation Secretary General Ekmeleddin Ihsanoglu speaks during the U.S.-Islamic World Forum in Doha June 9, 2013. PARIS (Reuters) - The outgoing head of the Organisation of Islamic Cooperation (OIC) said Tuesday some Muslim States should broaden rights for religious minorities. Ekmeleddin Ihsanoglu, who stepped down Monday after nine years as secretary general of the 57-country group representing the Islamic world, also said Western countries should do more to combat an increase of prejudice against Muslims there. The Jeddah-based OIC's religious diplomacy was long focused on a fruitless effort to have the United Nations pass a global ban on insults to Islam. The fate of Christian minorities in Muslim countries rarely figured in its declarations. "I have no doubt that there is room for religious freedom improvements in some parts of the Muslim world with regard to allowing non-Muslims to have access to their religious facilities or construction of such facilities," Ihsanoglu wrote in response to questions by email from Reuters. Christians in the Middle East frequently complain of restrictions or bans on churches there and their leaders, alarmed by the rise of hardline Islamists in the wake of Arab Spring uprisings, have tried to emphasise their long histories in the region and have urged their communities not to leave. At his Dec. 13 Vatican meeting with Pope Francis, Ihsanoglu said he stressed the need for "greater efforts from OIC member states to foster respect for religious pluralism and cultural diversity and to counter the spread of bigotry and prejudice". Ihsanoglu said both Pope Francis and Sheikh Ahmed el-Tayeb, grand imam of the prestigious al-Azhar centre of Sunni learning in Cairo, expressed support in recent meetings for his proposal to foster better ties between the world's two largest faiths. He first floated the idea in 2005, urging Western countries to recognise Islam as an official religion and promote better understanding of it through education. The focus then was mostly on what they should do to answer Muslim complaints. Relations Muslims and the Vatican, which weighs heavily in the inter-faith balance because its 1.2 billion Catholics make up just over half of all the world's Christians, worsened dramatically the following year. Pope Benedict's Regensburg speech, which implied Islam was violent and irrational, sparked protests in the Muslim world and cast a shadow over inter-faith relations despite his apology and efforts by leading Muslims and Catholics to mend fences. Ihsanoglu's meeting with Francis was the first between an OIC head and the pope. After his election in March, Francis said he was especially interested in improving ties with Muslims. Ihsanoglu said his proposals, for which details would have to be worked out, aimed at a reconciliation as far-reaching as that reached by Christians with Judaism in recent decades. A Vatican envoy recently visited al-Azhar to discuss resuming relations cut off in 2011 after Benedict condemned attacks on Christians in Egypt, Iraq and Nigeria and said they showed the need for better protection for religious minorities. Francis is preparing a visit to Jordan, Israel and the Palestinian Territories which would have Vatican relations with the Muslim world on its agenda. The date has not yet been set but officials say some time in May seems most likely. The Chaldean Catholic patriarch in Iraq, where about half the 850,000-strong Christian minority there in 2003 has since fled or been killed, proposed this month that the Vatican make a new effort to help Muslims understand Christianity. "Among other things, this document should explain, in language compatible with Islam, the magnificent doctrine of religious freedom," Baghdad Archbishop Louis Sako said. The OIC, now led by Iyad Ameen Madani of Saudi Arabia, is an intergovernmental organisation of 57 states that aims to protect the interests of the Muslim world. Ihsanoglu, a Turk, said he hoped his successor would follow up on his proposal.